CBOL has generously supported hosting the Laboratory Information Management System (LIMS) database since the beginning of the Barcode of Wildlife Project, but can no longer maintain this arrangement. Here is a guide to exporting your country’s data and setting it up locally. In the overall workflow of the Barcode of Wildlife Project, the LIMS database stores all of the lab-specific data associated with barcode sequencing of samples. A typical lab workflow starts with DNA extraction, then amplification of targeted DNA regions via PCR, followed by sequencing. The LIMS database also stores final version of sequences submitted to GenBank through this platform. Users document the progress of this workflow in Geneious using the specially-designed Biocode plugin, but all supporting data is stored in the LIMS database. 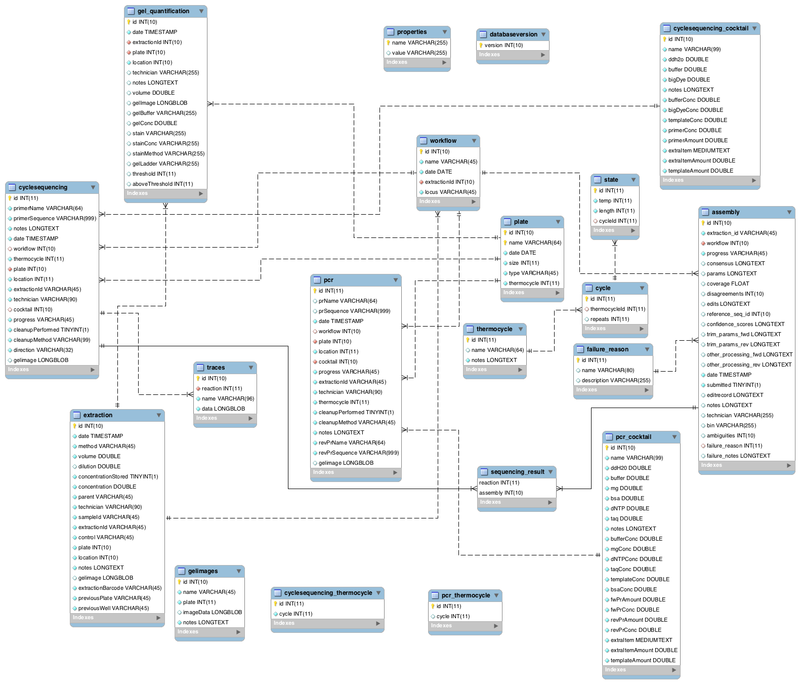 This is an Entity-Relationship diagram of the BWP LIMS database. You can click on it to see the full-size image. The same user account that was set up for troubleshooting connections to the database can be used to “dump” the contents for migration. The country-specific database names are “kenya_lims”, “mexico_lims”, and “south_africa_lims”. You will then be prompted for a password, which is “DNABarcodes”. I have prepared database dumps of each database on January 19, 2018 to profile the amount of space required, but it is a good idea to run the mysqldump command immediately prior to importing so that you get the “freshest” data. To import this SQL dump file into your own database, first set up an empty database in MySQL using the “CREATE DATABASE [DATABASE NAME]” command. It would probably be easier to keep the name the same, but you can change it to whatever you like. Again, you will be prompted for a password, but this time it will be for the USERNAME that you have set up on your local MySQL instance. Unfortunately the Biocode plug-in and LIMS database system are configured in a way such that all users are able to log in and modify ANY data contained in the database. You can create user accounts for each user, but we found that it’s easier to just create 1 account for each country.